Having plenty of tomatoes, carrots and other foods high in carotenoids may reduce the risk of breast cancer, especially the most deadly types, suggests a new study that spanned 20 years. The study, published in The American Journal of Clinical Nutrition, adds to a growing body of research on carotenoids, diet and breast cancer risk. Carotenoids are a large group of phytochemicals that you can spot in many red, orange and yellow fruits and vegetables. Beta-carotene and lycopene, found in carrots and tomatoes to name a few foods, are a couple of the more well-known carotenoids. They’re also in dark green vegetables, such as kale and spinach. 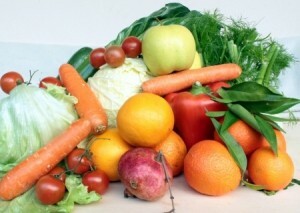 Previous studies on carotenoids and breast cancer have been mixed. This study builds on research by the same group suggesting that carotenoids affect different types of breast tumors. We wrote about that here. As in their previous study, the researchers used blood levels of carotenoids to measure intake. Back in 1989-90, they collected blood samples from almost 33,000 women who were part of the Nurses Health Study. Ten years later they collected another sample, with slightly less than half of the women participating again. All the women were regularly answering questionnaires about their health, weight, diet and other factors. By 2010, 20 year after the first blood collection, 2,188 of the women had been diagnosed with breast cancer. These women were matched against women from the same group who did not get cancer. If a woman who developed breast cancer gave one blood sample, for example, she was matched against a woman without cancer of similar age who also gave one blood sample. When the groups of women were compared to one another, the study found that women with the highest amount of carotenoids in their blood had 18 to 28 percent lower risk of breast cancer compared to those with the lowest carotenoid levels. This link was also found for specific carotenoids, such as beta carotene, alpha-carotene and lycopene. Risks were similar for ER-positive and ER-negative cancers. Higher blood levels of carotenoids even more strongly linked to lower risk of breast cancer that recurred or deadly. This suggests, write the authors, that carotenoids may particularly lower risk for the more aggressive and lethal breast tumors. More research is needed. It’s possible, the authors note, that this link found may relate to other phytochemicals in fruit and vegetables or an interaction of carotenoids with these phytochemicmals. The authors advise against supplements. AICR also, recommends not to rely on supplements to protect against cancer. In some instances, beta-carotene or other supplements may even cause harm. AICR’s most recent report on breast cancer found that women can reduce their risk of postmenopausal breast cancer by being physically active, staying a healthy weight, not drinking alcohol, and breastfeeding one’s child. This new study will be added to AICR/WCRF’s Continuous Update Project, which is analyzing all the research on an ongoing basis. To see which foods contains carotenoids — and the many other phytochemicals — visit our Foods that Fight Cancer.